New Simba Kettle Popped Popcorn offers fans extra crunch for enjoyment and is available in two delicious flavours, that South Africans are sure to love: White Cheddar Flavoured Popcorn and Sweet & Spicy Chutney Flavoured Popcorn. Backed by its undisputable heritage in the industry, fans can expect the same high quality experience from the new ready-to-eat popcorn snack that the Simba family has unfailingly delivered to consumers over the past 60 years. “Simba has consistently been a part of South African households and family sharing moments, innovating and evolving with fans over the years,” commented Sikelela Finini, Simba Brand Manager: Soft and Hard Extrudes Portfolio. “New Simba Kettle Popped Popcorn promises to deliver the same standard of quality, freshness and taste that ‘Roarrrs with Flavour’ that fans have come to expect from the brand. Using a traditional kettle-popped process, Simba Kettle Popped Popcorn offers an ideal snacking option for consumers seeking a satisfying, yet flavour-filled snack alternative. 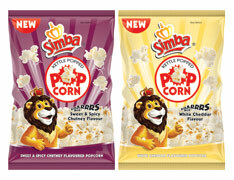 Simba Kettle Popped Popcorn is available in 90g bags, at a RSP of R9.99 from all major retailers nationwide. Technavio’s research analyst predicts the global popcorn market to grow steadily at a CAGR of approximately 7% during the 2016-2020 period. The growing opportunity in the snacks industry is the primary growth driver of this market. Globally, customers are spending more on convenient snacks, with some of these snacks acting as meal replacements. Customers consider both taste and health at the point of purchases forcing the snack manufacturers to understand the consumption drivers and build a product accordingly. The rising number of varieties and flavours of popcorn has also been contributing to the market growth. Numerous vendors have started including flavours like bacon, blue cheese, spicy or salted caramel, cheesecake and stout beer to cater to a large consumer based. RTE on the rise: The microwave popcorn segment dominated the market during 2015, accounting for a market share of around 55%. However, this research report anticipates this segment to lose its market shares to RTE popcorn during the forecast period. The changing customer buying preferences is a key factor for the declining market shares. Highly fragmented: The global popcorn market is highly fragmented due to the presence of numerous small and large vendors. The vendors in the market compete on the basis of price, quality, innovation, service, reputation, distribution, and promotion. The competition in this market is expected to intensify during the forecast period due to an increase in the number of vendors offering gourmet and new flavours, the demand for healthy snacks by consumers, and price wars among themselves.